​Here are a few recent recalls and their links that may be of interest. 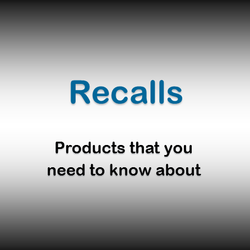 You can look up more recalls at the U.S. Consumer Product Safety Commission website. ​Whirlpool Recalls Microwaves Due to Fire Hazard. ​Cree Recalls LED T8 Lamps Due to Burn Hazard; Includes T8 Lamps Provided as Replacements in Previous Recall. ​​Polaris Recalls Ranger Recreational Off-Highway Vehicles Due to Fire and Burn Hazards. ​​Polaris Recalls RZR XP Turbo Recreational Off-Highway Vehicles Due to Fire Hazard; Severe Burn Injuries; Includes Previously Recalled RZR Turbo ROVs.